Welsh language campaigners have placed stickers on eighty of Wrexham Council’s road signs over the weekend. Hundreds of ‘Give Way’ signs across the county are in English only and have therefore been erected illegally, according to Aled Powell, chair of the Wrexham branch of Cymdeithas yr Iaith Gymraeg. The news comes as local councillors prepare to discuss a damning report by the Welsh Language Commissioner this Wednesday into consistent failures by the council to keep to legal duties to erect bilingual signage. “Since before Wrexham Council was formed in 1996, there has been a legal duty on each authority in Wales to ensure road signs are in both Welsh and English. 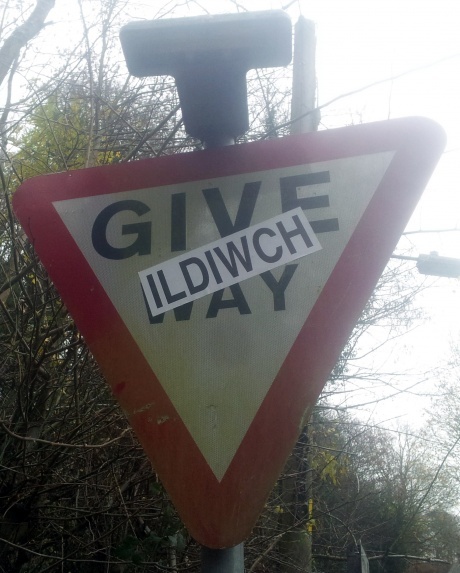 Campaigners have placed a sticker on dozens of the signs so they now have the missing Welsh ‘yield’ instruction: ‘ILDIWCH’. Before changing to its new Welsh language standards in 2015, Wrexham Council’s policy was to put the English first on road signs, different to many other Welsh counties. Aled Powell explained why one type of sign has been treated differently: “The unique shape of these particular signs means there’s not enough space to place the Welsh word, ‘ildiwch’, beneath the English term, ‘give way’, so Wrexham Council had to make an exception to their Welsh language policy. Information regarding these signs was the subject of a tribunal appeal brought against the Information Commissioner by Mr Powell in 2015. The tribunal panel, led by Judge Robin Callender Smith, came to the unanimous decision to allow Mr Powell’s appeal as it became apparent the Information Commissioner’s decision had been based on false claims by Wrexham Council, whom had denied having record of the locations of any of their ‘Give Way’ signs. Wrexham Council was directed by the judge to join legal proceedings as an additional party and subsequently changed the story it had stuck to for the previous fourteen months.